The beauty is in the details of the 4' and 6' Charleston bench which features a modern decorative design that combines form, function and inclusion. The contoured, steel slat seat is an exceptional design that is supported by a 1-1/2" cast aluminum tube frame with arm rests that increase its aesthetics and accessibility. The smooth, rounded edges of the Charleston increases the bench's comfort and safety. 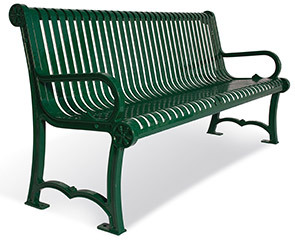 Sealed with an impact resistant and UV stabilized thermo-applied coating, the finish of this bench offers exceptional resiliency through many years of use while requiring virtually no maintenance. All models come complete with stainless steel hardware and allow for continuous expansion with the addition of a 4' or 6' add-on section.